Opioids are useful mostly in pain control and to treat acute pulmonary edema ( reduction of cardiac preload), cough suppression ( suppression of cough reflex in the brainstem) and diarrhea ( decrease motility of the smooth muscle). Methadone is a type of opioids which are useful in maintenance therapy for opioids addict with the aim to reduce the withdrawal effect. 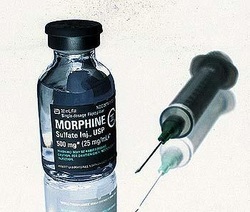 Opioids may developed tolerance and dependence. Patient may suffer from anxiety, chills and gastrointestinal discomfort as a result of abrupt opioids withdrawal. Opioids will lead to hyperpolarization of the neuronal cell membrane based on the reaction with potassium ion channel and calcium ion channel. This can be achieved by the binding of the opioids onto specific opioid receptors that present on the nervous system such as the brainstem, thalamus, amygdala, spinal cord and hypothalamus. Opioids may include morphine, fentanyl, codeine (to treat cough suppression), meperidine ( to treat diarrhea), hydrocodone, heroin, fentanyl and hydromorphone. Opioids overdose is best treated with naltrexone and naloxone. The common side effects of opioids are constipation, hypotension, respiratory depression, miosis and nausea.